et us know your what kind of team building event you are looking for and what your team building needs are. Building confidence in self and team. Improving our ability to communicate with each other and customers. Enhancing our ability to focus and be productive in a chaotic/stressful environment. Developing leaders and knowing when to lead vs. follow. Stimulating creative problem solving and being open to other points of view. Building trust among team members. Dealing with change, conflict, deadlines and constraints. Improving our ability to collaborate. Developing and executing plans for better results. Of course there many reasons but it is important to identify a few key goals. This way your facilitator team can design exercises to help participants address those concerns. Let us know your what kind of team building event you are looking for and what your team building needs are. Once we know that, we can customize the perfect team building program for your team. Click Here. Terrapin Adventures is conveniently located in Howard County, Maryland, between Baltimore and Washington DC. 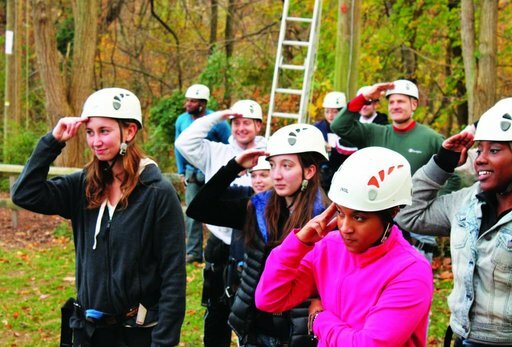 Our custom onsite and offsite team building solutions are presented in a fun and creative way that will help break down barriers, foster communication and teamwork, and help stretch the limits of your team. This entry was posted on Tuesday, November 12th, 2013 at 3:26 pm. Both comments and pings are currently closed.